Who doesn’t love feature furniture? A unique table, chair, or cabinet can up a room’s style game instantly. The problem sometimes can be price and that’s one of the reasons I love to DIY. I’ll let you in on a little secret about this video tutorial I was commissioned by the Bob Vila Academy* to create. I’d never made a drinks cabinet before! That’s why I truly believe that anyone, regardless of woodworking skills, will be able to do this. I say in the video that it’s intermediate in level but a determined beginner could do it too. 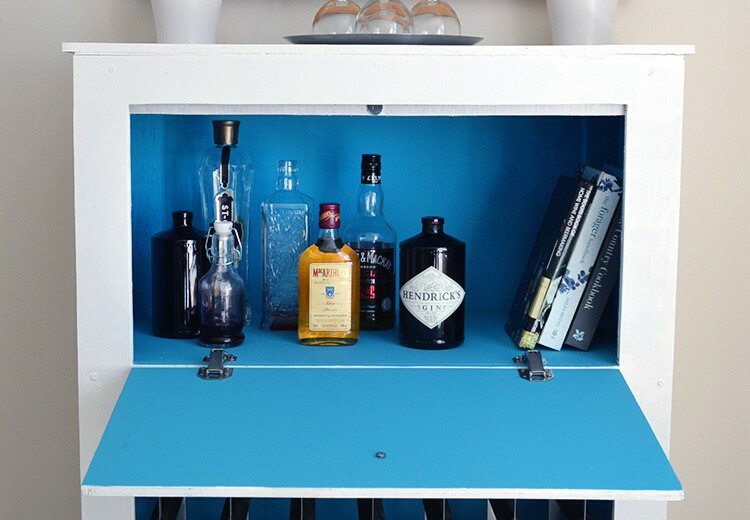 The cupboard opens to reveal a vibrant blue interior. 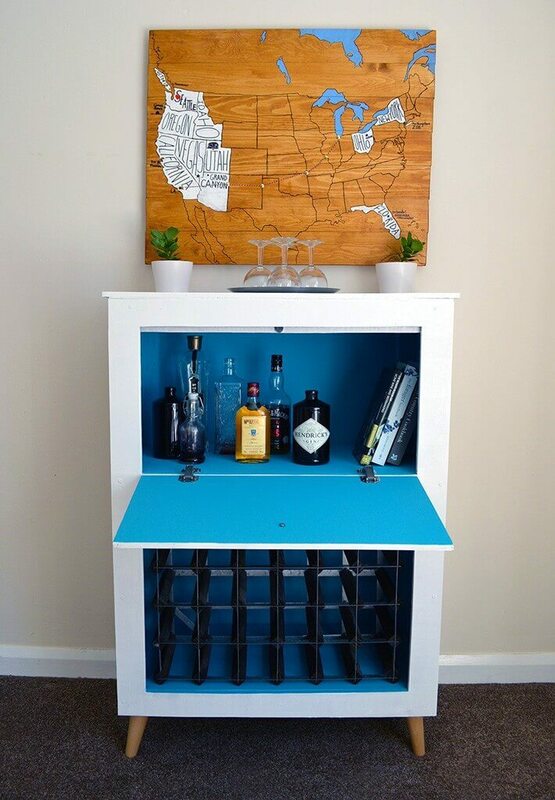 The idea behind this project was to use inexpensive materials such as plywood, pine, and hardware store fixtures to create a piece that I always wanted to have: A mid-century design inspired Drinks Cabinet! The materials I used are all listed below and can probably be found in a shop in your community. 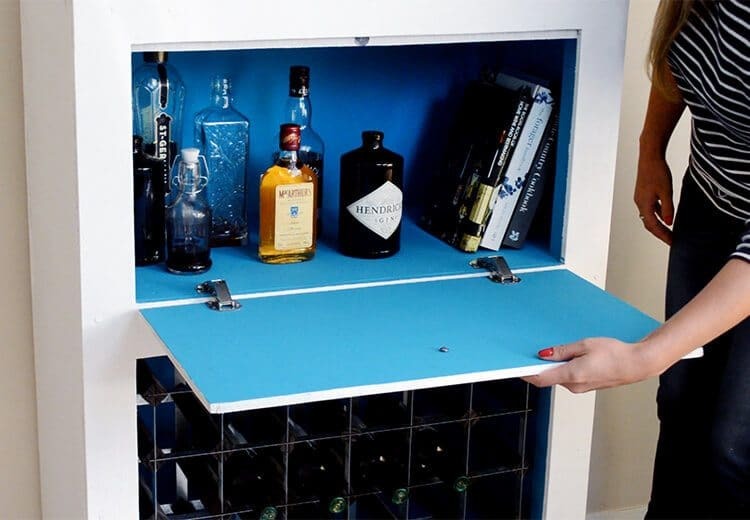 Barring that, online can sometimes save you hassle and expense for some items such as the cabinet legs or wine rack. I also HIGHLY encourage you to upcycle old furniture for this project. The legs are probably the most expensive single part so if you can scavenge legs off another piece it will save you some dosh. – Blue paint – I used a matte finish in Egyptian Blue Paint. The feet for the unit are set on mounting plates that cause them to angle out. 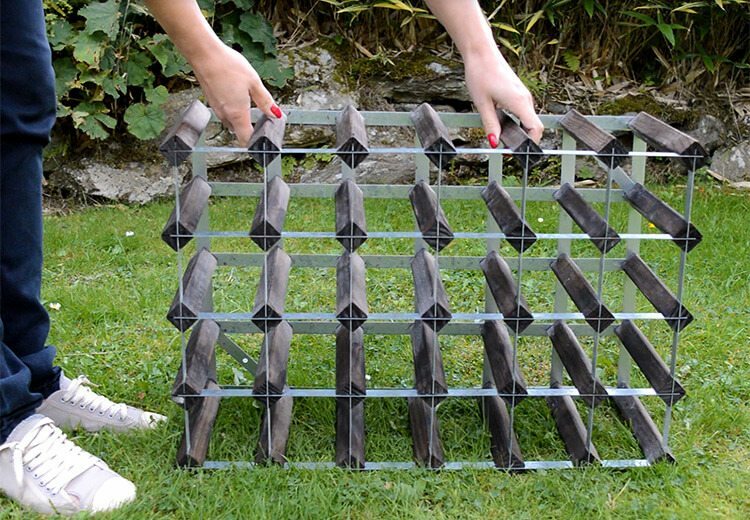 This project is relatively inexpensive if you already have the required tools. If you don’t, you’ll need to beg or borrow them off someone you know or invest in your own – If you plan on making more furniture and DIY projects then it’s a solid investment. Below is a list of the equipment you’ll need for this project as well as links to where you can purchase them off of Amazon*. 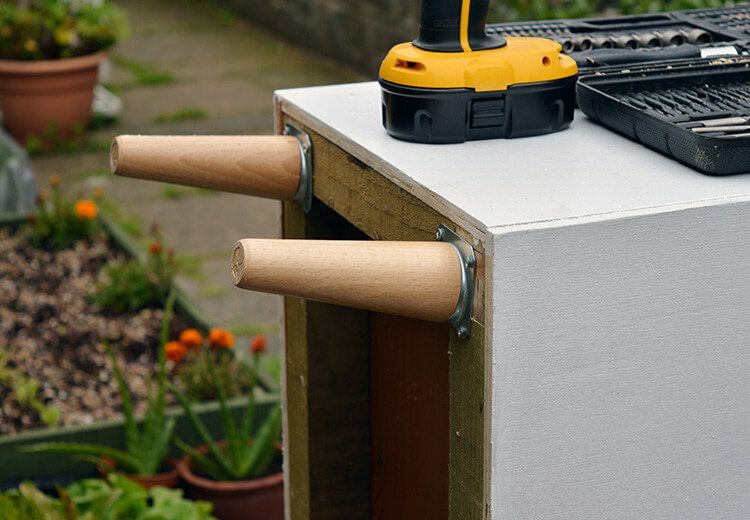 – a portable work bench – you can move this onto any flat surface to work on. A ready-made wine rack can be placed inside the lower cavity in the unit. This one is an old piece from Ikea. The ‘Lay-on’ Sprung hinges help keep the door closed and hold the door up when open. Now I hate being a tease but I did produce this project for Bob Vila and they have the video series for download over on their website. There’s also an introduction video that you can see here. If you’re interested in building the cabinet, do support me by purchasing the tutorial but know that you can leave any building questions as a comment on this post and I’ll be happy to help. Oh, and if you’re interested in learning how to make that personalised wood map you see in some of the photos, my full tutorial on how to make it is here on Lovely Greens (free btw!). My other video project with Bob Vila is how to make modern wooden coin banks with personalized plexiglass fronts. 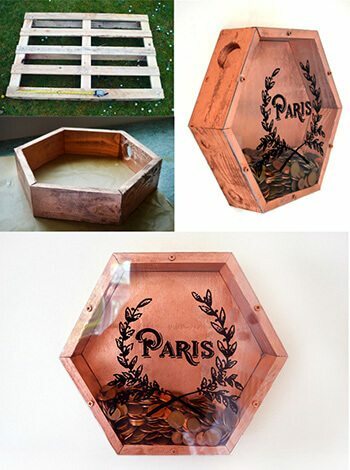 It uses pallet wood and other inexpensive materials. My other video project with Bob Vila is a tutorial on how to make these wall-mounted coin vaults using pallet wood. It’s an easier project than this one and really puts the shine of coins to good use in the home.